During the summer I hatched a plan with my 3 daughters to make daddy a ‘prayer’ quilt. Daddy gets up very early in the mornings to pray, but during the winter months it can be very cold at 5.30am! So we thought a snuggly quilt with especially chosen bible verses sewn into it would inspire daddy while he prays, and keep him nice and warm! I gave the children 3 calico squares each with a handful of fabric pens and off they went, writing and creating. I pre-cut 2.5″ strips from some of daddy’s old shirts and other shirt fabric I’ve acquired over the years. They chose their strips to border each of their blocks and they sewd them around their verses. Complete with spelling mistakes! So cute!! 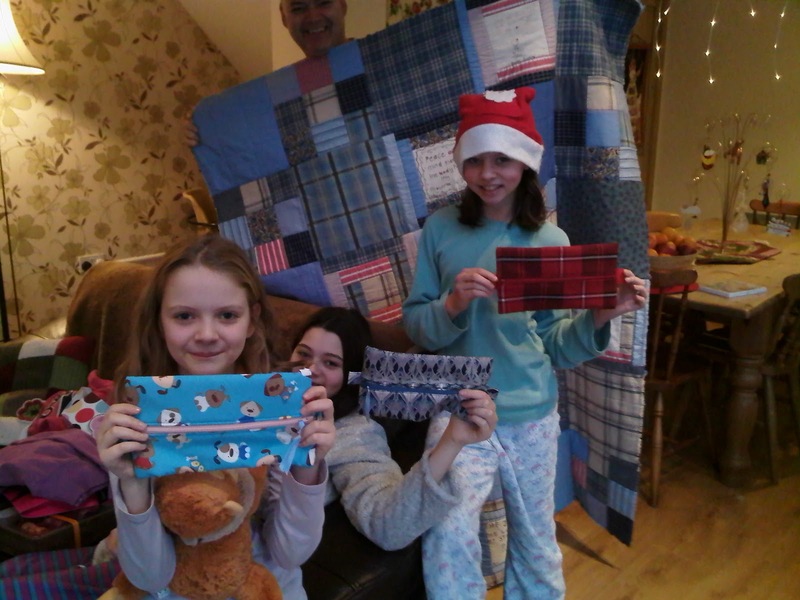 I then quilted them, and made them up into the quilt with other simple 9 square and log cabin blocks. The quilt was made in a raw-edge style – each block is quilted separately, then sewn wrong sides together. After snipping all the raw seams and putting it through the washing machine and tumble dryer, you get lovely fluffy seams. I designed the quilt so that the blocks on the front and the back are readable, so technically, there is no back! Both sides can be admired! 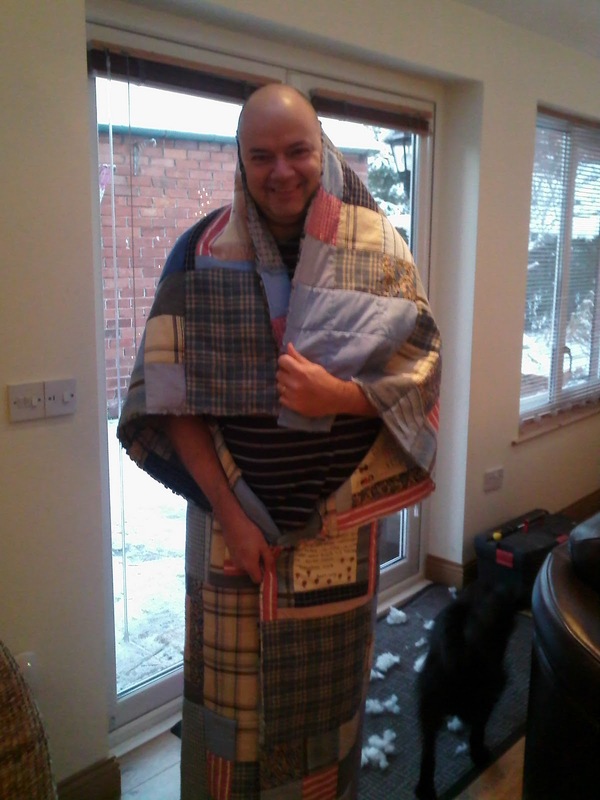 Needless to say, Daddy loved his ‘prayer’ quilt made by his girls and has enjoyed a few prayer times (& snoozes!) under it. My eldest daughter had announced before Christmas that she would like a new pencil case. I had recently spied a tutorial on Bits and Pieces Blogspot for a pencil case so thought I’d have a go. them up for Christmas day. They were delighted with them and were quickly filled with the new felt-tips and pens Santa had put in their sacks. Previous Previous post: Made for Me! Next Next post: Pincushion Pleasure!